Zootopia is a place where animals of all different species, from lion to llama, alligator to ant, predator to prey, co-exist in a lush, colorful and lively metropolis. Zootopia is The Land of Oz meets Tomorrowland meets New York City. Of the animal kingdom, of course. And miles away, in a much smaller place named Bunnyburrow, little Judy Hopps has big dreams. Unheard-of dreams. She wants to become a police officer. But not just any old PO, a Zootopia Police Department PO. There’s just one teeny, tiny problem — she’s a bunny. And the ZPD has only ever hired predators. Jaguar? Sure. Bunny? Not likely. Historically, prey have never dared venture into such a dangerous line of work. But Judy isn’t just any ordinary “prey.” And despite what her pragmatic and fearful parents tell her about “not following her dreams” and how “carrot farming is an exciting career,” she’s determined to make her dream come true. And she does. After graduating the top of her class at the academy, Judy is officially Officer Judy Hopps, ZPD, and is now off to save the world. But once in Zootopia, what she finds is a place less like a dream and more like…reality. Her neighbors are rude and loud. Police Chief Bogo has absolutely no faith in her, and relegates her to parking duty, despite there being a whopping 14 missing mammal cases. And when she does make an attempt at more than just issuing parking tickets, crime fighting turns out to be a real bust. Zootopian life is certainly not what Judy thought it would be. That is, until a Mrs. Otterton steps into Chief Bogo’s office. She’s a distraught otter whose husband, Mr. Otterton, is one of the missing mammals. And she’s desperate for someone to help find him. Judy, always quick on the draw, volunteers for the job. Chief Bogo, at the urging of the assistant mayor, begrudgingly assigns her the case. However, he only gives her 48 hours to find the missing otter, otherwise she must immediately resign from the ZPD. Hot on the case, Judy enlists the help of a key witness and con artist by the name of Nick Wilde to help her solve the mystery. But, what starts out as a simple missing mammal case turns into a mammal-wide conspiracy of life-threatening proportions. Disney’s Zootopia is a beautifully earnest movie about justice, friendship, adventure, and so much more. Just when I thought Disney could do no better, and if you’ve read my recent review of The Good Dinosaur you’ll understand, here they create the most vibrant and sumptuous world that I’ve not seen on the animated screen in a long while. As in, I’m packing my bags for Zootopia right now. But it’s not even the quality of the animation that makes this movie so remarkable — it’s the characters. Judy (voiced by the lovely and perfectly cast Ginnifer Goodwin) is my new hero. She’s a badass bunny who refuses to take no for an answer. Tell me, why do characters like this only ever exist in either superhero or animated flicks? This is how females, of all species, should be portrayed in film. And then we have wily Nick Wilde. Yeah, sure, he starts out as an impossibly abrasive schmuck, but as the film progresses, we see a warmer, kinder and completely lovable side to him. And, he’s sharp as a tack — thanks to a wonderful script, as well as great voice acting by the perpetually witty Jason Bateman. 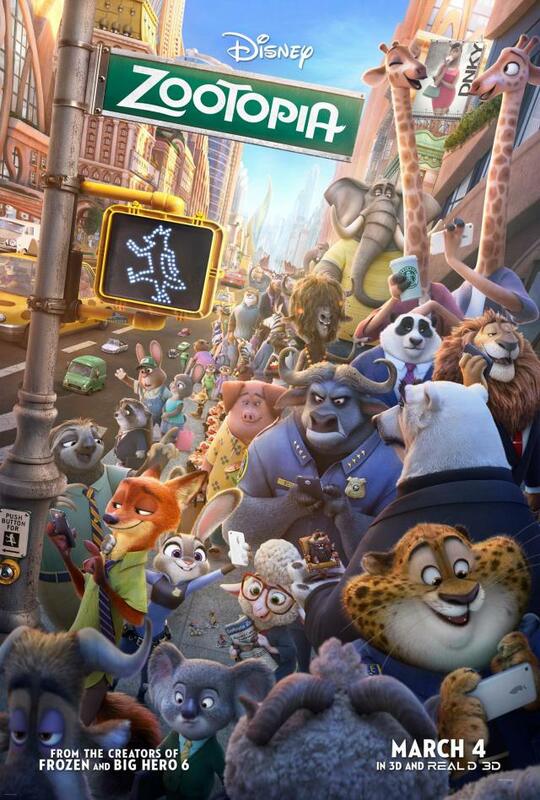 There are also so many secondary characters that I completely fell in love with — the charmingly chubby cheetah, Officer Benjamin Clawhauser (Nate Torrence), the larger-than-life buffalo, Chief Bogo (Idris Elba), and Flash the sloth, to name a few. It’s oftentimes difficult to make characters feel so beloved on the first go-around, but Disney has definitely succeeded in making me want to see much more from all of these lovely creatures. Admittedly, I found myself smiling and singing long after I left the theater, due in large part to the original song “Try Everything” performed by Shakira (who also voices the character of Gazelle), an inspirational and jaunty tune that I’m sure will be played on repeat by millions of six year olds around the world. And then there’s the story behind it all. It’s laugh-out-loud funny, it’s touching, it’s thrilling and, most importantly, it’s timely. This is the exact right time to release a movie like Zootopia. I recommend that kids watch this one. And I strongly recommend that adults watch it, too. Well, take a look at the character of Nick, for example. He’s a fox, and all his life he’s been pulling cons just to get by. That’s all he’s ever known. He’s convinced he isn’t suited for any other type of life, because that’s what society has conditioned him to think. In this world, foxes are seen as untrustworthy, dangerous, and troublesome predators. They’re ostracized simply for being foxes. Sound familiar? And Judy, because she’s a small, “dainty” prey, is incapable of doing the jobs that the larger, stronger predators can. Like the work of a police officer. How about now? Zootopia is a deliciously entertaining film that also offers up some pretty poignant lessons regarding stereotypes and prejudice, racism and sexism, and how we should all treat each other. And, frankly, if it takes an animated film like this for some small-minded folks to finally check their behavior, then so be it. My guess is that, this time next year, Zootopia will have an Oscar nomination under its belt. Yup, it’s that good.